C1509. SIR JOHN BARBIROLLI Cond. Boston S.O. : Symphony #2 in E-flat (Elgar). (Canada) St Laurent Studio YSL T-415, Live Performance, 7 Nov., 1964, Symphony Hall, Boston; Interview with Barbirolli, 1959. Transfers by Yves St Laurent. “I can still recall the shock I felt when, at the age of 22, I heard this performance on a Boston Symphony Orchestra radio broadcast. I was familiar with the ‘Enigma Variations’ but had no knowledge of Elgar’s two symphonies. I sat through the Second Symphony transfixed, went on to explore both symphonies, and have loved them ever since. This performance has been issued before (on Music & Arts), but St. Laurent Studio’s release gives it renewed currency, and the sound is fuller and cleaner than before. I haven’t listened to Barbirolli’s 1964 performance for many years, and coming to it afresh, I wondered whether my affectionate memories were caused more by the dramatic impact it had on me than by its lasting musical qualities. 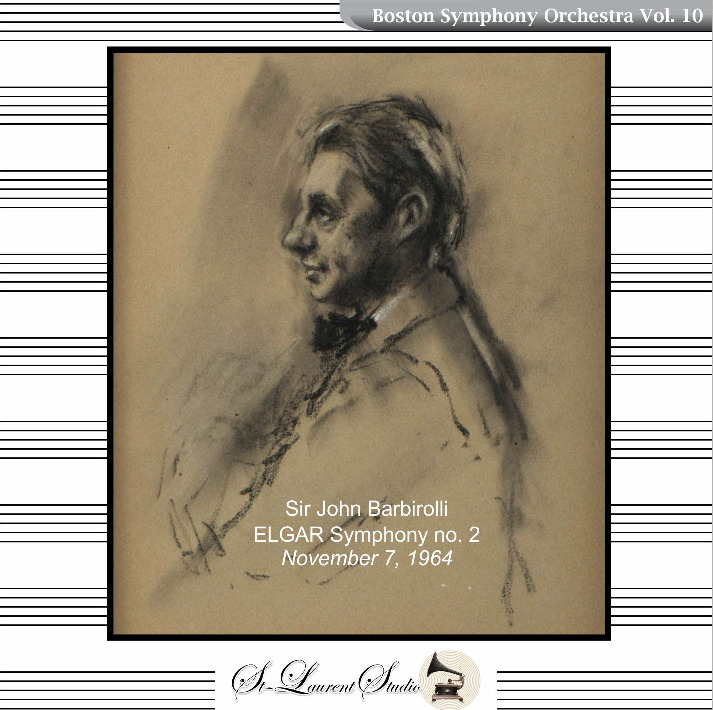 After all, Barbirolli made two recordings of the work under studio conditions with an orchestra far more familiar with him than Boston. But in fact, rehearing the performance now only sharpens my feeling that there is something very special happening. 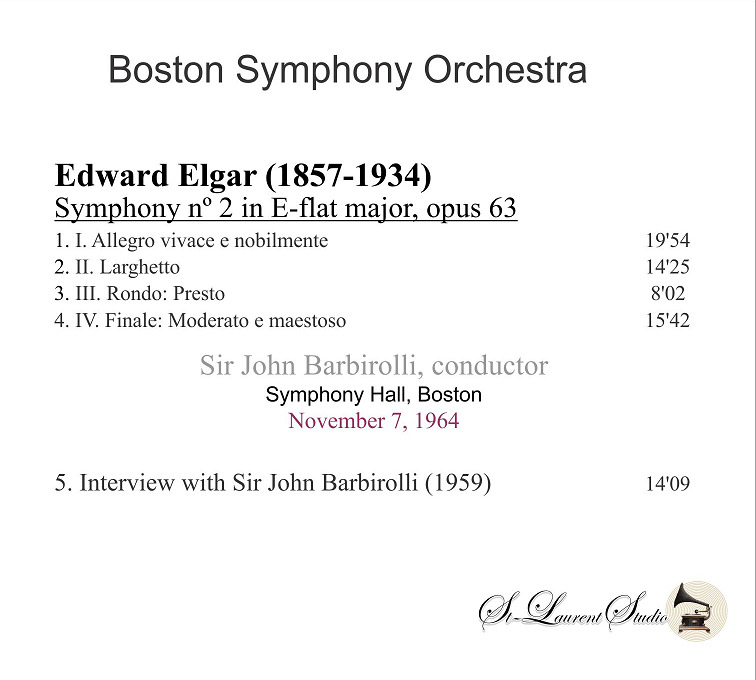 First, the BSO is a finer orchestra than Barbirolli’s Hallé Orchestra was in either 1954 or 1964 when he made his two EMI recordings of the work. The BSO may have had to learn the music for this Symphony Hall concert, but learn it they did. The refinement of the playing, the glow of the string sound, and the concentration of the players all make this a reading with great impact. 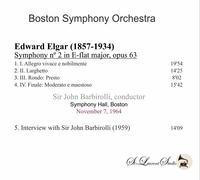 Barbirolli’s tempi are on the slow side (at 57:55 a full ten minutes slower than Elgar’s electrical recording, and longer than with most other conductors), but the line never sags. The Larghetto is a thing of hushed beauty, drawing the listener into the music. The rhythms are particularly taut in the third movement, which has more life and sparkle here than on the conductor’s stereo EMI recording from the same year. The grandeur of this piece, especially in the outer movements, can spill over into excessive weightiness or self-importance. Finding the right balance so that the music’s nobility is not slighted but at the same time maintaining forward momentum is tricky. For me, Barbirolli manages that better than most other conductors, and hearing him lead one of the world’s greatest orchestras is unforgettable. “Sir John Barbirolli studied cello as a boy, making his début public appearance at the age of twelve. He received a formal education at Trinity College of Music and the Royal Academy of Music, from which he graduated in 1916. Upon graduation, he found a position in the Queen's Hall Orchestra, becoming its youngest member. He made his professional solo début as a cellist in Aeolian Hall, London, in 1917. During World War I he joined the British Army; while in the service he got his first taste of conducting by leading an all-volunteer orchestra. After his service ended in 1919, he returned to the Queen's Hall Orchestra. He also resumed performances as a cello soloist, appearing with the Bournemouth Municipal Orchestra. He joined and toured with the International String Quartet beginning in 1923. Soon after, he organized and conducted a chamber orchestra in Chelsea. The British National Opera Company engaged him to conduct on tour. On 12 December, 1927, he attracted attention by successfully substituting as conductor of the London Symphony Orchestra when Sir Thomas Beecham was indisposed; during the 1928 season he began to conducting opera regularly in London at both Sadler's Wells and Covent Garden. In 1933 he was appointed permanent conductor of the Scottish Orchestra, remaining in that position for three seasons. At the same time he was the conductor of the Leeds Symphony Orchestra, and guest-conducted several orchestras at home and abroad. During the 1936-1937 season he accepted a ten-week position as guest conductor of the New York Philharmonic. This led to an invitation to assume the principal conductorship of that orchestra, in which capacity he succeeded Arturo Toscanini. Barbirolli remained with the Philharmonic through 1942. During his tenure in New York, he gave the world premieres of the Violin Concerto and the Sinfonia da Requiem of Benjamin Britten, then resident in New York. While in the United States, Barbirolli also appeared with various American and Canadian orchestras. Barbirolli was never a favorite of the New York critics during his time with the Philharmonic, and many audience members wanted something more flamboyant than his objective approach. And his relationship with the members of the orchestra wasn't always harmonious; but he had the support of Arthur Judson, the orchestra's manager, who especially appreciated the fact that the conductor tended to work well with guest soloists, whose performances were a major source of prestige for the orchestra. He was reportedly offered a new contract at the end of his fifth year, but to accept would have required him to take American citizenship, something he was unwilling to do with England locked in the midst of a battle for survival. He returned to England in 1943 and began his long tenure as conductor of the Hallé Orchestra in Manchester, which he ultimately transformed into a world class ensemble rivaling the London Symphony Orchestra and the London Philharmonic, as well as such postwar ensembles as the Royal Philharmonic and the Philharmonia; in 1958 he reduced the number of yearly concerts he performed with them when he took the title ‘Conductor-in-Chief’, and in 1968 he retired from the Hallé with the title ‘Conductor Laureate for Life’. Meanwhile, he had returned to America; recruited by the Houston Symphony Orchestra's indefatigable patroness Ima Hogg to succeed Leopold Stokowski, he became their conductor from 1961-1967. The 1960s were also marked by many guest and touring appearances with the Philharmonia Orchestra, the BBC Symphony Orchestra, and the Hallé. He was knighted in 1949 and was made a Companion of Honour in 1969.